Hungarian President Viktor Orban delivered his state of the nation speech on Sunday, and for supporters of his nationalist, anti-immigration Fidesz Party, it did not disappoint. Because, in a policy revelation that is sure to agitate George Soros, the European Commission (and Parliament) and every other supporter of the pro-immigration globalist policies that Orban opposes, the Hungarian leader declared that, from now on, all Hungarian women who give birth to four or more children will be permanently exempt from income tax…for life. 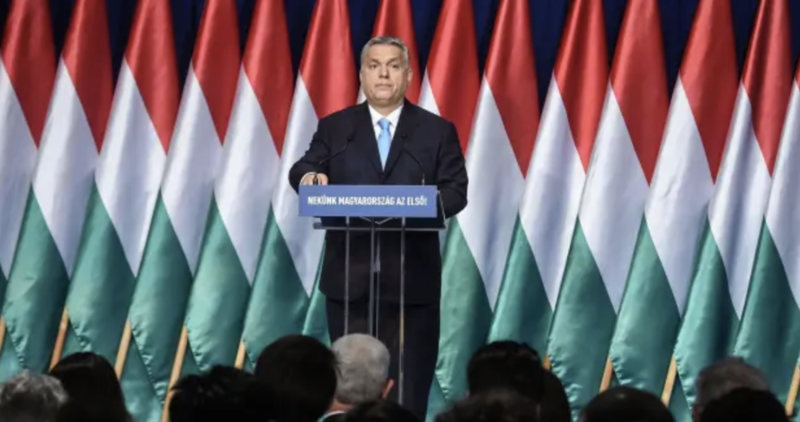 In his speech, Orban portrayed the policy as necessary for bolstering Hungary’s faltering birth rate without adopting more lax immigration policies, which other Western democracies see as the answer to their own demographic issues. The birth-rate tax plan was one of several initiatives unveiled by Orban, whose party won re-election last year by a wide margin. His policies enjoy broad support in Hungary, particularly in the countryside, though they have also encountered vociferious opposition from those whose political views are more closely aligned with Soros. Earlier this year, protesters nearly sacked the Hungarian Parliament after political opponents accused Fidesz of a blatant power grab by creating a new federal court that many feared would be used to crack down on political dissidents. Other initiatives unveiled by the anti-immigration premier included an investment in healthcare worth Ft700bn ($2.4 billion); loans to newly-weds worth that could be partially, or fully, forgiven if the couple has two or three children in the years after the ceremony, and money for purchases of family cars – as well as increased funding to expand child-care facilities. Orban also promised mortgage-forgiveness tied to childbirth, and paternity or maternity leave tied to grandparents. According to the FT, Hungary, like many of its neighbors in central and eastern Europe, struggles with some of the lowest fertility rates in the world, while many of its best-educated workers have traveled elsewhere on the Continent in search of better employment prospects. Its population is forecast to fall by 15% by 2050, from 9.7 million in 2017 to 8.3 million. Orban’s government didn’t offer an estimate of the cost of the new measures, according to Reuters, and Orban’s chief of staff, Gergely Gulyas, said they would be financed from the country’s 2019 budget. Here are some more details on Orban’s plan, courtesy of Reuters. Orban isn’t alone in pushing these types of incentives to inspire more couples to have more than one child. In recent years, both Poland and Serbia have adopted similar measures. Other countries in the region have also offered incentives to raise the birth rate. In Poland, the conservative Law and Justice party rose to power in 2015 with an expensive pledge giving 500 zlotys (£100) a month, about one-third of the net minimum wage, for every second and subsequent child. The initiative costs more than 1 per cent of Poland’s GDP Last spring, Serbia, which loses 30,000 people annually, introduced a 500m dinar (£3m) fund to provide payments worth 12,000 dinar for families with three children and 18,000 dinar for the fourth. He said that permitting migration resulted in “mixed population countries” in which Christians would eventually become a minority. “Those who ride that train will go to the last station and there’s no return ticket,” he said. But while Soros is sure to oppose these policies, even as his “Open Society” organization has been exiled from the country, Secretary of State Mike Pompeo said something with which, we imagine, Orban might agree: During a speech in Budapest, Pompeo warned about the growing influence of China and Russia in central Europe, and said he would try to make the case to Orban that doing business with Chinese telecoms giant Huawei might risk Hungary’s security, according to the Associated Press. Huawei is a major player in the Hungarian telecoms space…and China’s growing influence in Hungary has been viewed with alarm by US officials.